Eye shadow palettes have fast become the slogan tee of the beauty world: Everybody is doing them. Yes, we love every single one of our Urban Decay Naked palettes, and we always find ourselves returning to our trusty Tom Ford quads, but with so many palettes already spilling out of our Muji storage and with new ones launching on what feels like a daily basis, it takes something pretty special to get the Byrdie team talking (and swatching). 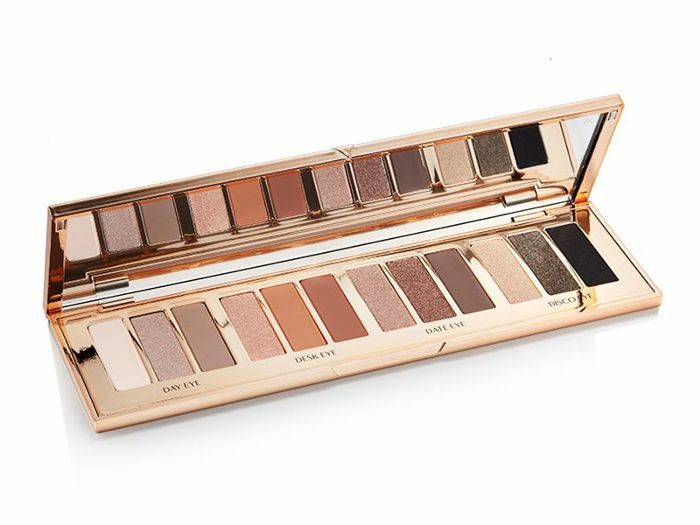 But that's exactly what Charlotte Tilbury Instant Eye Palette (£60) did, so when last month's 24-hour presale sold out in record time, we were worried that not everyone would get to experience it. Thankfully, it's finally back in stock, so keep scrolling to find out why you need it. For starters, it completely contradicts our theory that every good eye shadow palette houses at least one shade you never seem to use. Amongst the 12 neutral shades in this palette, there isn't a single dud. Instead, just a dozen impressively silky and universally flattering hues. And it gets better because this palette takes all the guesswork out of applying eye shadow. The shades are split into four looks (Day, Desk, Date and Disco), each with three shades (a base colour, a shading tone and a hue for adding extra definition). But of course, you can mix and match as much as you want, too. But our favourite thing about the palette is that each shade has been specifically milled depending on how you'll use it. So the lighter shades are loosely compacted to provide a soft wash, whereas the darkest, most dramatic shades are tightly compacted for unprecedented colour payoff—genius. Sounds incredible, right? Once you've got your hands on this palette, we'll talk you through exactly how to apply eye shadow.